Karl Landsteiner is best known as the scientist who discovered the four blood groups and made safe blood donation possible, allowing for the first successful transfusion in 1907. Karl Landsteiner’s contributions to modern medicine included discovering the polio virus along with fellow scientists Constantin Levaditi and Erwin Popper. Continuing his work, the researcher later discovered the M, N and P blood factors which were later used as distinct classifications of blood groups. Together with his colleague Alexander S. Wiener, Karl Landsteiner developed the second most known blood group, the Rhesus blood group, along with the famous Rh factor. Karl Landsteiner’s ample research on blood groups and immunology represents one of the foundations of modern medicine and has earned him a Nobel Prize in Physiology or Medicine in 1930. His findings marked the success of the first blood transfusion and pioneered the way for safe blood donation whilst allowing medical professionals to save countless lives. His research proved multi-disciplinary as the budding branch of forensics science sought to apply his discoveries to create unique blood fingerprints that could aid them in investigations. According to some, the first blood transfusion represented, in a way, the first successful form of transplant. As it’s argued, blood is no different from other tissues or organs in the sense that it is essential for life and transfusions come with a similar set of risks, notably rejection and infection, thus requiring a match between donor and recipient. As such, it can be said that Karl Landsteiner pioneered the first ever form of transplant with his discovery of blood groups that allowed for matching of tissues followed by transplantation years later. On June 14, 2018 we will be celebrating 150 years since the birth of Karl Landsteiner, the father of transfusion medicine and a pioneer in immunology. 1) The blood groups. Karl Landsteiner discovered the A, B and O blood groups in 1901. In 1900, the researcher observed that mixing the blood of two people caused it to thicken. This reaction sparked his interest and one year later lead to the discovery of three blood groups: A, B and O. Based on these findings, he was able to determine that only a transfusion between two people of the same blood group was safe. In 1902, the fourth blood type, AB, was discovered. This particular classification is known as the ABO blood group system and is currently one of the two reference points in determining blood type. When the same antigen and antibody come into contact, coagulation occurs. This is why you can’t give type A blood to someone with type B: type A has antibodies for antigen B and type B has B antigens. Type O blood is a universal donor and type AB a universal recipient. Those with type Oh can only receive a transfusion from those with their blood type because the antigen H can cause an immune system reaction in people with other blood types and this could result in destruction of red blood cells. 2) Rhesus blood group and Rh factor. 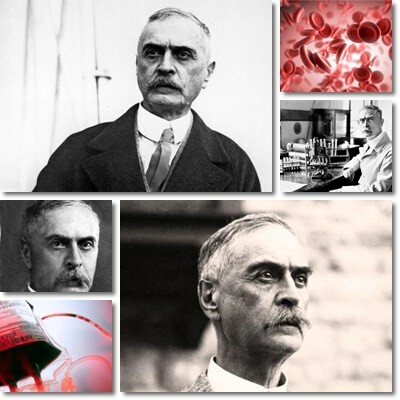 The next major contribution to hematology of Karl Landsteiner was the discovery in 1937 of a second blood group and of a specific blood factor called Rh, both of of crucial importance to transfusion medicine. The new blood group was names Rhesus, after the monkey species with the same name. It has around 50 different molecules that give it its specificity, all occurring naturally in blood. The most relevant to hematology is the Rh factor which refers to the D antigen specifically and represents a determining factor in establishing blood types compatibility as well as has helped in explaining the nature of the hemolytic disease in newborns. In hemolytic disease in newborns, an Rh- mother comes into contact with the blood of her Rh- child (most likely inherited from the father) which causes her immune system to develop antibodies for the Rh (D) antigen. These antibodies may reach the fetus and cause destruction of its red blood cells with potentially serious outcomes. 3) The discovery of the polio virus. Karl Landsteiner together with two other fellow physicians, immunologists and virologists have isolated the polio virus and proved the disease it caused, poliomyelitis, was in fact of an infectious nature. The discovery occurred early into his career, in 1909 and represented the identification of one of the most virulent and severe pathogens in modern history. If the polio virus infects the central nervous system, it can cause meningitis, varying degrees of temporary or permanent paralysis. There is no cure for the disease. The discovery of the causative agent has allowed for the development of the first polio vaccine in 1950. 4) The MN, S (or MNS) and P-antigen blood groups. Karl Landsteiner with the help of colleague Philip Levine discovered three new blood groups in 1927. Although not at the forefront of transfusion medicine, these new types are nonetheless relevant for transfusion medicine. Conclusion. When somebody asks you who is Karl Landsteiner and what did he do, you can say he is the scientist who discovered the ABO and Rh blood groups which establish compatibility in blood donation and identified the polio virus. He was an Austrian immunologist with published papers on serology, virology, bacteriology and allergy, winner of the 1930 Nobel Prize in Physiology or Medicine and a pioneer of modern transfusion medicine. His work was of great value for forensic science and paternity testing. And since he was born on June 14, 1866, this June 14, 2018 will be the anniversary of 150 years since the birth of Karl Landsteiner.